There’s really no room for being a marginal lumber producer these days, says Robert St-Martin, general manager of the newly re-opened Forex Inc sawmill in Ferme-Neuve, Quebec. “We have to be among the best. We have to process timber as quickly as possible, with high efficiency and at the least cost.” They need to do all of this, he says, to survive in what is still a recovering lumber market. With 40 years of experience in the forest industry, St-Martin has seen the good old days—and the bad days—in the industry. In the current business environment, he is a strong believer that efficient equipment and skilled workers, capable of multi-tasking, are the ingredients for a winning recipe for the Forex sawmill—formerly the Max Meilleur sawmill—in Ferme-Neuve, a small town about 200 kilometres northwest of Montreal. Robert St-Martin (left) manager of the Forex Inc. Ferme Neuve sawmill, bought by the Cossette brothers in 2010, with René Cossette, one of the Forex Inc. owners. Forex has committed to investing $5 million in the sawmill. The Max Meilleur sawmill belonged to the same family for nearly a century. Though it was founded in 1915 by Fortunat Meilleur, its sawmill technology was more of the era of Fortunat’s grandson, Léandre. A few years before it ceased operations, the Meilleur family sold 30 per cent of the business to the Upper Laurentian Forestry Co-op. 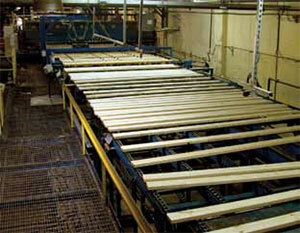 But despite everyone’s best efforts, the sawmill closed in 2009, due to the industry downturn. In its better years, the sawmill employed 150 people, with another 350 working in logging operations. In August 2010, the Cossette Brothers of northern Quebec, owners of Forex, and who have been involved in the forest industry for more than 50 years, bought the sawmill, buildings and equipment. Among the conditions required to reopen the mill was an agreement with the existing union, affiliated with the Communications, Energy and Paperworkers Union of Canada. 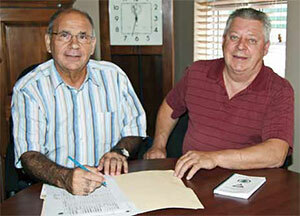 In July 2011, the union and the new owner signed a five-year agreement that goes to 2015. “We have made a commitment with the union to invest $5 million in new equipment, in order to secure a major update of the facilities,” says René Cossette, one of the owners. From the 150 workers who used to work at the sawmill, about 50 have been recalled, and the mill now runs on one shift. “The average age of the worker is 45 and they have a huge amount of experience.” They also have skills in different areas of the mill, which is very helpful, adds Cossette. 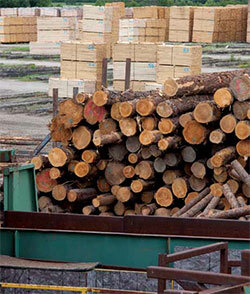 Processing fir, jack pine and spruce for lumber customers in Quebec, New Brunswick, and Ontario, the sawmill’s owners are patiently waiting for an improved economy, to expand their market. “We’d rather concentrate our efforts on a domestic market,” says mill manager Robert St-Martin. Born in Abitibi, Quebec, St-Martin has been working in the forest industry since the early 1970s, and knows the business well. Having studied accounting, he worked for the Cossette Brothers until 1989. He then moved to Domtar, in Val d’Or. 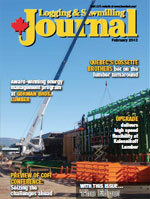 In 1994, he returned to the Cossette Brothers and worked on the construction of their OSB mill in Maniwaki. After that, he moved to New Brunswick for Produits Forestier Alliance, then to Bowater Inc at Price in eastern Quebec. He then returned to work for the Cossettes at the end of 2011. “I came back home,” he says jokingly. Processing fir, jack pine and spruce for clients located in Quebec, New Brunswick, and Ontario, the sawmill’s owners are patiently waiting for an improved economy, to expand their market. “We’d rather concentrate our efforts on a domestic market,” says St-Martin. The upgrade by Forex started in September 2011, with the installation of a 17-inch Nicholson A5B debarker and a stationary electric Barko 275B loader. “To date, we have invested more than $3.5 million on a new debarker, a 48’’x 60’’ rotary hog, a Prograder linear optimizer and an upgrade of the Sawquip sawline,” explains St-Martin. The new owners also bought a used USNR 500 hp rotary hog in January 2012. At the end of the summer of 2012, they upgraded the sawline. They are also looking to improve the existing sorters, installed 15 years ago, and the boilers, which means another investment of at least $1.5 million, adds St-Martin. The facility has six kilns, which were installed between 1994 and 2002. Two Cathild kilns have a capacity of 100,000 board feet each. The others, all made by MEC, have a capacity of from 115,000 board feet, to 163,840 board feet. 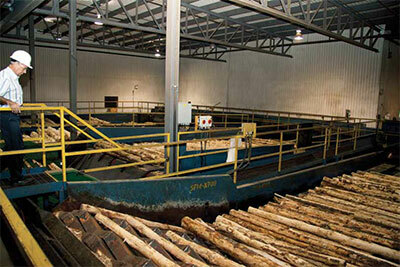 In early 2012, a new Autolog Prograder linear optimizer was installed at the Ferme Neuve sawmill. According to mill manager Robert St-Martin, the Prograder has met their expectations, even handling their difficult to process fir. There is competition in the surrounding region. “Resolu in Maniwaki, Crête in St-Faustin, and the Kruger sawmill located in Parent,” says St-Martin. “And when the lumber demand comes back, the competition will be fierce. The market is not there yet, so there is no impact at the moment. Essentially our problem, which is the same for all of us, are the chips.” There is a surplus and prices reflect that reality.